Spy Tec Adhesive Mount For Mobius Action Camera and Standard 1/4"-20 Tripod T.
Maximum Tripod Load:2kg. Built-in bubble level, making your tripod perfectly leveled. This Traveler Tripod with pan head design is the best choice for outdoor photograph activities. Whether you are a Novice or Professional photographer, you will need a steady and robust tripod for many of those wonderful photos. With simple design and compact size, universal cell phone tripod (mount) adapter is easy to use. Width adjustable & 1/4" Screw Thread: Width can be adjusted from 5.8cm to 10.5cm. Attachable to any regular sized tripod, monopod and smartphone with standard 1/4" screw thread at the bottom. Fits any smartphone from 2.3inch to 3.3inch wide such as: iPhone 7 (Plus) 6 5 iPod, Samsung Galaxy S7 S6 S5, Note, LG, HTC One series, Motorola Moto X G, Nexus7 6 5, Sony Xperia Z5, and More Cell Phone360 degree rotating phone holder for portrait mode (vertical) or landscape mode (horizontal)Made from premium quality plastic and soft protective rubber for extended durability and protectionBoth the top bracket and bottom mount can fit tripod, monopod, selfie stick or other filming device with 1/4-20 connection.Mobile phone clip size: 58mm- 105mmMaximum weight: 1 kgWeight:72.5gInterface: International standard screws 1/4Material : ABS Package included: 1 x Tripod AdapterNote: Light shooting and different displays may cause the color of the item in the picture. With standard tripod hole, you can install in standard 1/4" tripod stand. 1X Cell Phone Holder clip(The tripod not included). Clip width: Approx. We want to make sure you are happy with our item. Goods without RMA number will NOT be accepted. Both the top bracket and bottom mount can fit tripod, monopod, selfie stick or other filming device with 1/4-20 connection. 1 x Tripod Adapter. 360 degree rotating phone holder for portrait mode (vertical) or landscape mode (horizontal). Included: 1 x Tripod. The bracket adapts to a variety of devices and is easy to install. Simple design, free expansion, accommodation does not occupy space, convenient to travel. Due to the different display and different light, the picture may not show the actual color of the item. 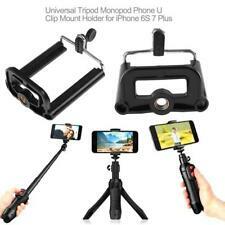 Install on tripod /monopod any device with 1/4" thread. The Tripod Mount is small enough to travel with you wherever life takes you. Its quick access mount lets you instantly swap devices. The unique two screw hole design! 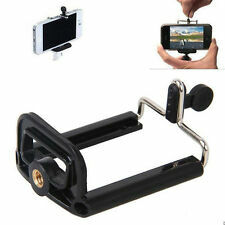 2pc x Cell Phone Holder clip (the tripod and other accessories not include). Allows you to attach your phone to a monopod or tripod for better quality picture. Compatibility: 5.5-8.5cm/2.0"-3.5" Body-Wide Smart Phones. Install on tripod /monopod any device with 1/4" thread. The Tripod Mount is small enough to travel with you wherever life takes you. Its quick access mount lets you instantly swap devices. Universal screw thread at the bottom for attaching this bracket to any regular sized. Two screw holes design! can be sideways shot or vertically shot. 1 x Phone Clip Bracket (only including phone clip, not including the tripod/monopod and phone shows in pictures.). Clip range: 57-88mm/ 2.24-3.46". 1 x Red Stand. Can be safely placed anywhere you want such as rock, branch, barbed wire, fence and so on. Design: Two screw holes design! can be sideways shot or vertically shot. 1 x phone clip (only including phone clip, not including the tripod/monopod and phone shows in pictures.). Clip range: 55-85mm. Universal Cell Mobile Phone Clip Bracket Holder Mount For Tripod Monopod Stand!